Whether you live in Southern California or northern Maine, your kids will get cold come winter. November through March (and later for some northern climes) often brings cloudy days and long, dark nights that sap out warmth, turning your little ones’ fingers and toes frigid. You need to be prepared for the cold days ahead with plenty of warm clothing for your kids — but not just any warm clothing will do. To guarantee that your kids have the mobility they crave — even when they are well-bundled — you need to plan their winter wardrobe. Here are the essential elements of an ideal winter outfit for children, so you can be sure your kids won’t complain of the cold. 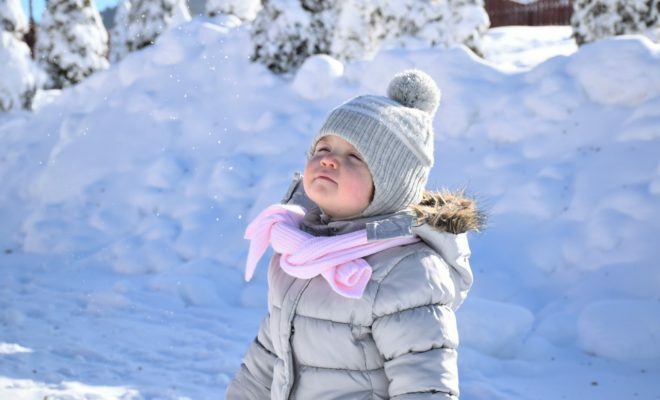 Your little one’s head is often uncovered during the cold weather months — and it is the body part most susceptible to frostbite. This is because the features on the face and head don’t have much room for large blood vessels that carry warmth to fend off freezing temperatures. Though the brain receives plenty of blood flow (in fact, it contains as much as 20 percent of the body’s blood) the tissues around the skull don’t have much blood to speak of. As a result, body parts like the ears, the nose, the lips and even the eyelids can freeze, resulting in tissue death and infection. Toes are the next most likely extremity to freeze. Smaller than fingers — and farther from the heart — toes get cold even indoors during the winter months, so it is imperative that you wrap them in the right coverings whenever your kid goes outside into the rain, wind and/or snow. Let’s start with socks. While you might be drawn to cotton, this material actually isn’t ideal at all during the wintertime. First, it doesn’t insulate heat very well; secondly, it keeps moisture close to the body, which lowers body temperatures and causes uncomfortable rubbing and blisters. For wintertime, wool is a much better choice because it is moisture wicking and extremely warm. Plus, you can find wool socks in any color and style to suit your child’s preferences. Next, when it comes to children’s boots, there are a few features you should focus on. For one, they should be waterproof, so snow and rain doesn’t seep inside and freeze your kid’s toes. Ideally, the uppers will be made of heavy-duty nylon or leather while the lower is a thick rubber. The boots should be insulated, and they should have enough space inside to fit your child’s foot and a thick wool sock. Once you have your bases covered, you can begin shopping for what your child wears in between their head and toes. Generally, you should plan for your kid to wear at least three layers when they venture out into the cold: a base layer that wicks moisture, a middle layer that insulates and an outer layer that repels water, wind and other elements. If you add too many layers into the mix, your kid could end up sweating, drenching their clothes in sweat that will freeze and lower their body temperature dangerously. As with socks and shoes, the materials you choose for each layer matter; they affect how comfortable your child is in their outfit and how well they can move around. Ideally, the base layer will be some kind of synthetic material, like polyester, because they are lighter, softer, more flexible and more wicking than natural fibers. The middle layer can be wool, down or fleece, but it shouldn’t be so heavy and stiff as to restrict movement. The same goes for the outer layer, which should also be some kind of synthetic, like Gore-Tex. You should always shop with your kids in tow, so you can try layers on to ensure they fit right in terms of size and style. Finally, you shouldn’t forget mittens. Little hands are often stuck deep into snow during the winter months, which means your kid’s digits are at risk for frostbite. Fingerless gloves are a bare minimum for anywhere that temperatures dip low, but full gloves as well as mittens are ideal. You don’t need to keep your kid cooped up all winter to avoid the cold. However, you shouldn’t let them run around outside in shorts and a t-shirt, either. With the right winter wardrobe, you and your kids can have freedom and fun during the cold months without any risk of catching a chill.